Great news! 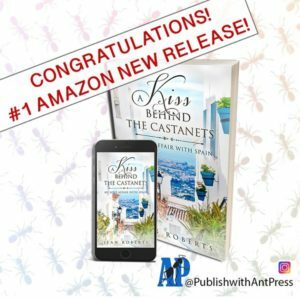 I’m excited to tell you about my new book “A Kiss Behind the Castanets: My Love Affair with Spain” which is out now. It is available for your Kindle through Amazon. The paperback is also available on Amazon and I have signed copies if anyone would like to buy one from me. Now also #1 Best Seller in Family Travel on the Amazon Australia website. For all purchasing information, please see details under the reviews. I have also included some of the reviews which readers of my book have been kind enough to post on Amazon. I read this book on the strength of a recommendation from a friend of mine. It is funny to the point of laugh out loud which caused a few raised eyebrows around a very quiet and sedated hotel pool. This couple’s experiences in getting to grips with Inland Spain is amusing as they seem to leap from one adventure to another, although, not always taking it in their stride. It is a particularly heart warming book and generally shows how two different cultures can get along and thrive. It was difficult to put down, which cost me dearly as I got burned in the Florida sun! 5.0 out of 5 stars From a character in the book! This is a fantastic book, have really enjoyed reading it. Well done Jean, looking forward to book 2! I enjoy reading about the lives of other people, but sometimes it can be a bore. This author has avoided that trap and her easy reading style pulls you into her story, the good and the bad. It is a very courageous thing to open your life up like that. Thank you for sharing it. 5.0 out of 5 stars A ‘must read’ for any would be buyers of Spanish property. A very frank , informative and often funny account of the pleasure and some pitfalls of investing in Spain. Recommended read. A humorous account of moving to Spain, lots of local people and expatriates stories. Also about most anything you need to know about ,customs, food and charming characters. Enjoyed this one. 5.0 out of 5 stars A wonderful ‘Feel Good’ book. Full of humour and love – this is a real ‘cuddle up’ book! A real comfort. It makes me want to visit Jean and her family in her beautiful casa! A warm and funny incite into an expats move to Andalusia, with hilarious language misunderstandings, and thoughtful reflections of the Country, culture and people. I thoroughly enjoyed the yarn from start to finish. This book is a great way to learn about a different culture to my own. Jean has managed to capture the essence of Spanish life, while offering her take on the pitfalls of moving to a different country. Throughout, Jean maintains a wonderful sense of humour, which makes the reader want to read & then turn the page to see how a particular catastrophe turned out. It’s an honest account of a Brit making the most of opportunities- can’t wait for the next instalment- and yes, she is right when she says I still, to this day blanche at the sight a of a cardboard box ! Although I have to admit, it was fun at the time! 5.0 out of 5 stars Lovely book and I thoroughly enjoyed it! I love travel and moving abroad memoirs and was so pleased to read this first in a new series of Moving to Spain Memoirs by Jean Roberts. What an amazing cover too-it makes it an irresistible book! I really liked her ‘voice’ coming through the writing. A nice quick first chapter got the book moving easily. More of the same followed, again, very pleasant, short and to the point chapters. It was a lovely, easy read with great info about the local foods. It was also informative-eg. the bit telling about harvesting olives. Historical details too. I liked the funny mistakes with the lingo, very entertaining. I can’t wait to read more from this author and am so pleased to see that there will be a sequel! The book started out as some diary entries. What a lovely book has emerged from those. An excellent read which I thoroughly enjoyed. Pre ordered this book as having lived in Spain for 16 years, I never get tired of reading about this country, this book lived up to expectations and surpassed them. An absolute must read whether you live in Spain or plan to live here or have no plan. hoping the author has more up her sleeve,it does say book 1!!!! Brilliant book thoroughly enjoyed reading it. Well done Jean. A wonderful humorous insight into the ups and downs of owning a house abroad. The author managed to describe Spain in such a way that I now want to visit. Hopefully more from this author very soon. 5.0 out of 5 stars Unputdownable! Looking forward to reading more about Jean and Adrian’s life and adventures in Spain in the next book.